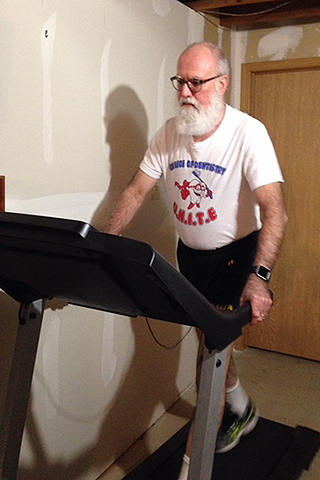 David Drake’s wellness routine includes a daily treadmill session each morning. “It takes diligence and commitment to maintain this practice,” he says. Photo courtesy of David Drake. David Drake, professor of microbiology in the Iowa Institute for Oral Health Research in the College of Dentistry, has some advice for those seeking to be truly productive: relax. “Over the years, I have learned a lot about what it truly means to be productive—it is NOT about how many tasks you check off each day,” says Drake. “It is about doing work that truly matters and has an impact. The value of health became increasingly important to Drake about a year ago, when he was diagnosed as being pre-diabetic. The diagnosis heightened his commitment to lifestyle medicine. He now follows a healthy, low-carbohydrate eating plan for his meals and snacks. Drake recommends two books that support the idea that a healthy lifestyle will enhance productivity: Rest by Alex Soojung-Kim Pang and High Performance Habits by Brendon Burchard. Drake has also found that exercise contributes significantly to better blood sugar regulation. He now includes a short treadmill session in the morning and more substantial treadmill session in the evening as a part of his daily routine. The methods Drake uses in managing his health and sustaining his productivity continue to take time and energy, but remain a priority.